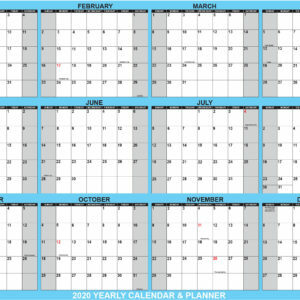 SwiftGlimpse 2020 Dry Erase Wall Calendar Planner is available paper, laminated or framed for all your home and office planning needs. 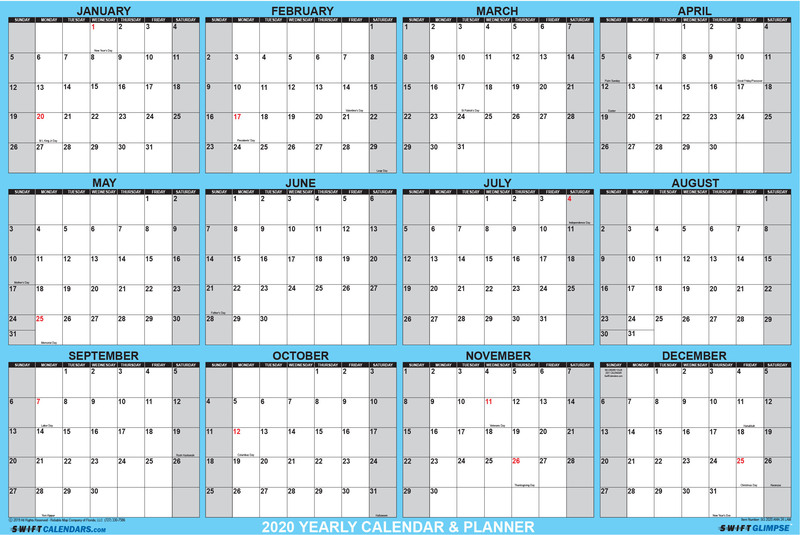 SwiftGlimpse 2020 Erasable Wall Calendars: Our yearly wall calendars give you a “glimpse” and huge poster display of all 12 months, January – December 2020 – in one large view to keep you organized all year long. Julian dates. Track projects, create schedules, make daily notes, schedule vacations or simply just glimpse ahead at future months. Federal holidays are highlighted in red for clear differentiation. Large unruled, daily blocks. SwiftGlimpse wall calendars will give you plenty of space to jot down important notes and reminders for the year. Features a contemporary design and printed in blue and black inks as shown on quality heavy-duty papers. LAMINATED Calendars! 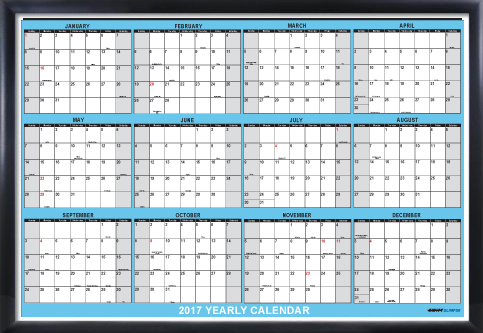 Each erasable calendar is laminated on both sides with a durable 3mil lamination – perfect for use with wet or dry erase markers. Note: we highly recommend “Wet Erase” markers! Why? Unlike dry markers, Wet Erase does not fade – does not stain or ghost – does not accidentally rub off if brushed up against – and comes completely clean with a damp cloth! For best results – please use our branded SwiftGlimpse line of Wet Erase Markers! Easy DIY (do-it-yourself) wall hanging with push-pins, Velcro, double-sided mounting tapes or 3M Command Strips (hanging suggestions not included). SwiftGlimpse Wall Calendars are available in a variety of large wall sizes: 24×36, 32×48 and now a huge jumbo 48×72. 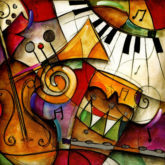 This edition is printed on both sides and allows for reversible hanging based on your wall space. 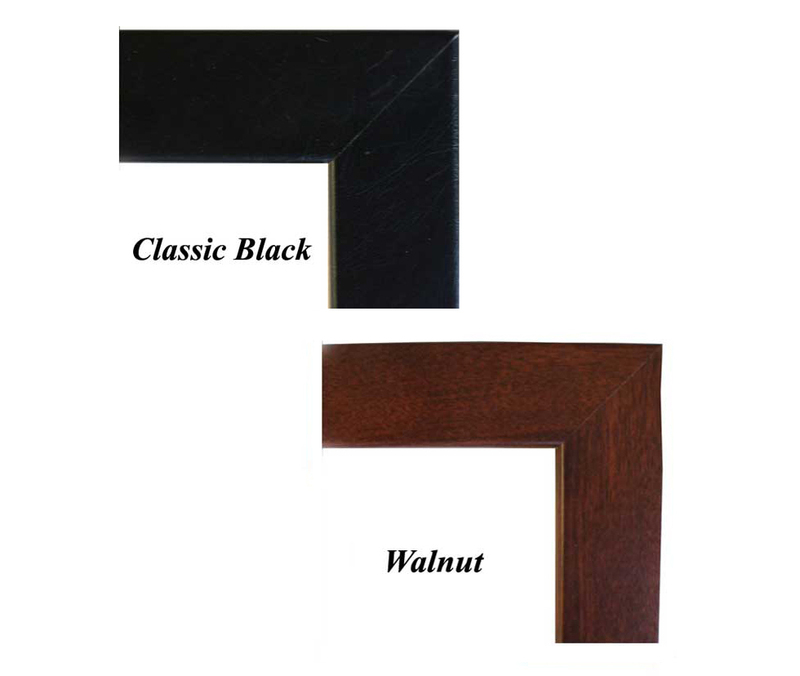 Hang vertically or horizontally. Only the best from the SwiftGlimpse line of popular wall calendars!! 2020 Yearly Wall calendar covers 12 months from January – December to keep you organized all year long! 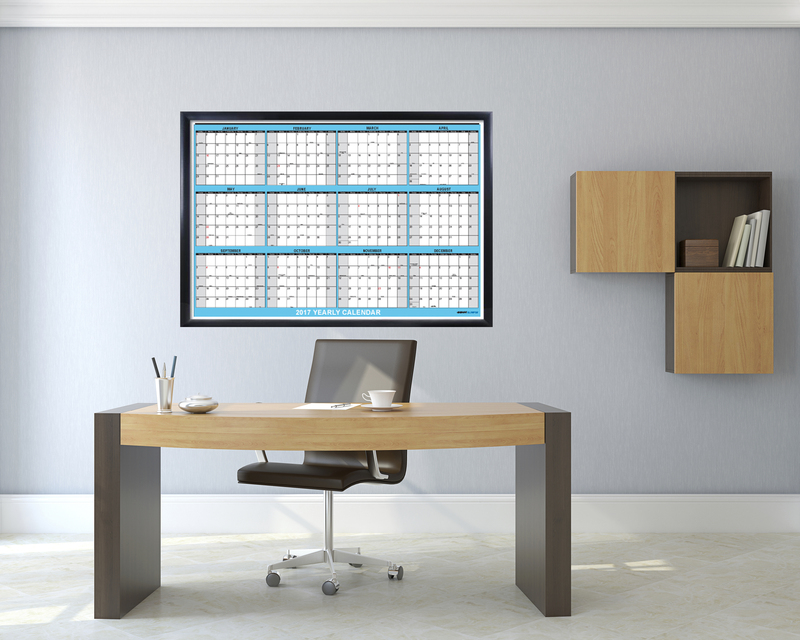 X LARGE 2020 CALENDAR BLOCKS: Each Wall Calendar features XL blocks for scheduling and notes. Bold and large print with bright white background allows for easier viewing and reading at-a-glance. 2020 DRY ERASE CALENDAR vs WET ERASE? Why do we promote Wet Erase markers? Wet Erase most importantly will not ghost or stain! No matter what any company claims – dry erase can stain or “ghost” due to the acids in the inks. Wet Erase is also very durable, doesn’t fade and will not wipe off accidentally by rubbing against it while writing in other date blocks. FREE MARKER INCLUDED! !